Rose Presznick’s Feather and Scroll pattern name is more descriptive, but it’s Marion Hartung’s Quill label that has stuck. In fact, the pattern bears scant resemblance to a quill. Regardless, Quill is an attractive pattern, produced in carnival during the Dugan years but not beyond. Dugan probably created the pattern design soon after launching its carnival line in 1909. It has been written that the firm first offered Quill in non-iridescent pattern glass and in the Filigree line in the pre-carnival era. I can find no evidence in the “Fry” anthology of Butler Brothers (and other wholesalers’) catalog reprints or elsewhere to confirm this claim. However, it is possible it may have been advertised in other early promotional materials. The principal design elements of Quill pitchers are: (a) six double feather figures, each “tied” at the bottom, one of which is partially obscured by the handle; this element occupies about two-thirds of the available (specifically, the lower portion of the) surface, (b) a one and one-half inch enclosed band of twelve standing ovals just above the feathers, and (c) an unpatterned one-inch self-contained band above the ovals. There are also nondescript small stylized figures interspersed among the feathers. 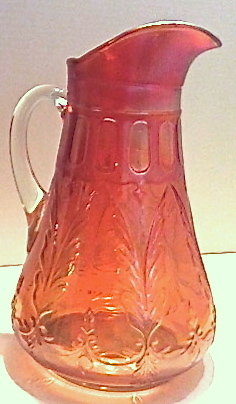 Mold blown, the pitchers are about ten and one-half inches tall at their highest point, ten inches on the sides opposite the spout and handle. Their handles—clear crystal on the marigold, a nearly opaque deep purple (or oxblood) on the amethyst—are separately attached. The handle is sometimes rough where it was attached to the body, especially at the top. Pitchers are available in marigold and amethyst. The color quality is highly variable. The surface color on the marigold ranges from a wispy light to an intense dark. The base color of the amethyst is almost always a rich wine purple. Iridescence on the marigold runs from weak and washed out to a strong marigold with pastel pink or rose highlights. Iridescence on the amethyst can be electric, multicolor, “good gold,” or silver. 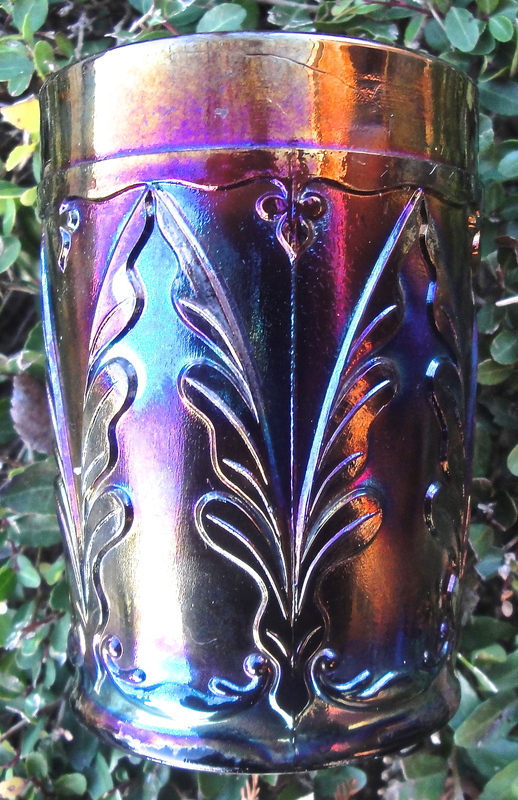 The shiny silver treatment is what the manufacturer alternately called “steel” and “gun metal.” Surface color is on occasion even all around and from top to bottom but more often uneven with a combination of the aforementioned iridescent treatments. Dugan marketed gun metal and steel as color options, I suspect to unload ghastly cast glass that came into being when something went awry during production to avoid taking a financial hit. This is, of course, a color that is almost universally shunned by today’s collectors. 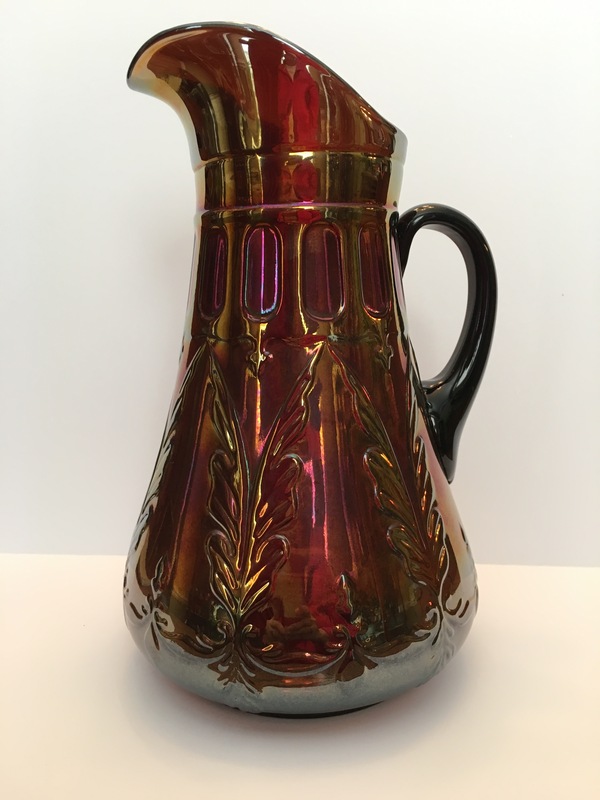 The pretty marigold pitcher pictured had been in the collection of former ICGA president Carl and editor Ferne Schroeder until selling last April. At that auction, it was purchased by Gerald Welsh from Iowa. Gerald is fortunate to have something tangible by which to remember the Schroeders. 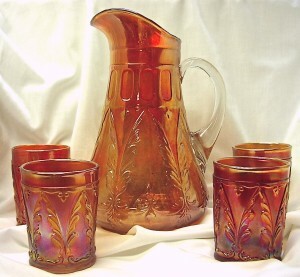 The vibrant amethyst pitcher illustrated is owed by Ray and Shirley Henry from South Carolina. They specialize in collecting pitchers with matching tumblers, and they are constantly on the lookout for upgrades. Their Quill had been in Lawrence Renn’s collection until it was sold by Seeck Auctions in November 2015. The Quill tumbler design is different from the pitcher. It is defined solely by the double feathers, as the enclosed band of standing ovals and the contained plain band above the ovals on the pitcher are absent on the tumbler. Tumblers are three and fifteen-sixteen inches tall. They have a two and seven-eighth inch top diameter and a two and five-eighth inch base diameter. The base of the tumbler is unpatterned. They were made from a three-part mold. Tumblers, like pitchers, are available in marigold and amethyst. Besides the typical iridescent treatments, the amethyst is also found with the steel overlay. 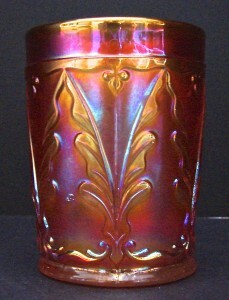 Both of the featured tumblers have sparkling iridescence. The shimmering marigold had been in Carl and Ferne Schroeder’s collection and remained with Ferne until she died in 2015, after which Barb and Don Chamberlain bought it at auction. It may have been providence and is certainly fitting that its ownership passed from one Pump editor to another. Until recently, the radiant multicolor amethyst was in former ICGA president Richard Cinclair’s hands. In this case, there is no coincidence as to how its ownership passed from him to a new owner. He responded to a WWWCGA Mailing List call for photos of nice Quill pieces and then agreed to sell it to a grateful Dugan collector. No made-from-tumbler whimsies have been reported. 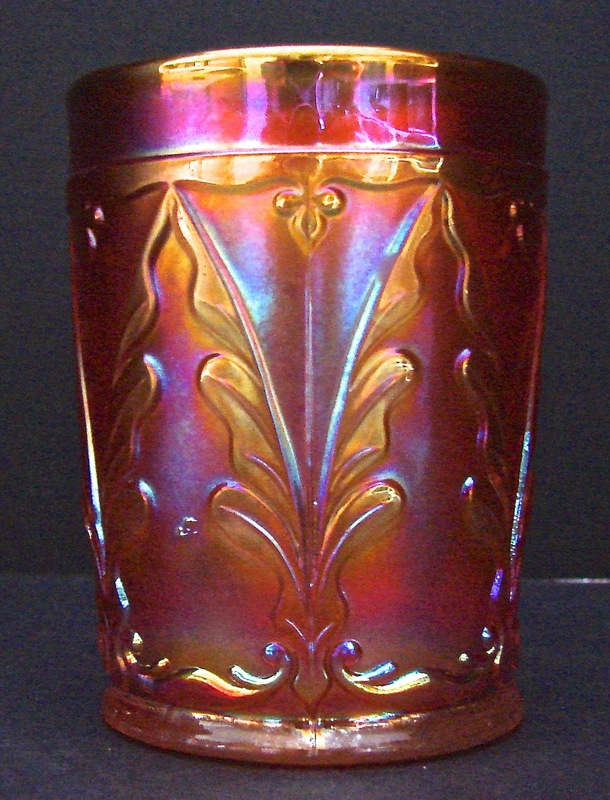 Quill pitchers and tumblers, especially those with great color, are hard to find. Water sets are even tougher to come by. The well-matched marigold set pictured is from the collection of Steve Gregg. He purchased it from Lloyd R. Ward, a luminary in the world of carnival glass sales. I have been unable to track down an amethyst water set to show. My thanks to those who provided the great photos and relevant information for the article. 1A picture of a gold-decorated green Wavy Quill pitcher can be viewed in Heacock, Measell, and Wiggins’s Dugan/Diamond: The Story of Indiana, Pennsylvania, Glass (p. 84, n. 191). An advertisement for a Wavy Quill lemonade set from a 1909 Butler Brothers catalog is reproduced in the same book (p. 65).